We are very happy and excited to announce that starting this month of December, IGA Kendo Club will be offering classes in Alphaland City Club in Makati! The City Club offers three hectares of state-of-the-art facilities dedicated to fulfilling your most demanding lifestyle needs. Located along Ayala Avenue extension, the club is within walking distance from most of Makati's major offices, residential buildings, and commercial establishments. Envisioned as a members' only club, The City Club's three floors of leisure, business, and entertainment options provide the conveniences of work, home, and everywhere in between under one roof. Envisioned as a members’ only club with a tastefully designed interior, it has three floors that cater to all your business, lifestyle, and fitness requirements. Stay fit in our fully equipped, state-of-the-art athletic complex, including indoor tennis, basketball, squash and badminton courts. Find relaxation and rejuvenation at our total wellness spa or lushly landscaped pool and Jacuzzi areas. Hold private meetings or events in our exclusive full-service function rooms. Savor a leisurely meal in one of our eight specialty restaurants, and let your children enjoy the playground, Wii, and game rooms. Nowhere else in Makati will you find all of these options in a single, exclusive club. While the City Club was initially envisioned as a members’ only club, the management has since decided to open their facilities to non-members. They now (or will) offer a variety of classes of which Kendo will be a part of. 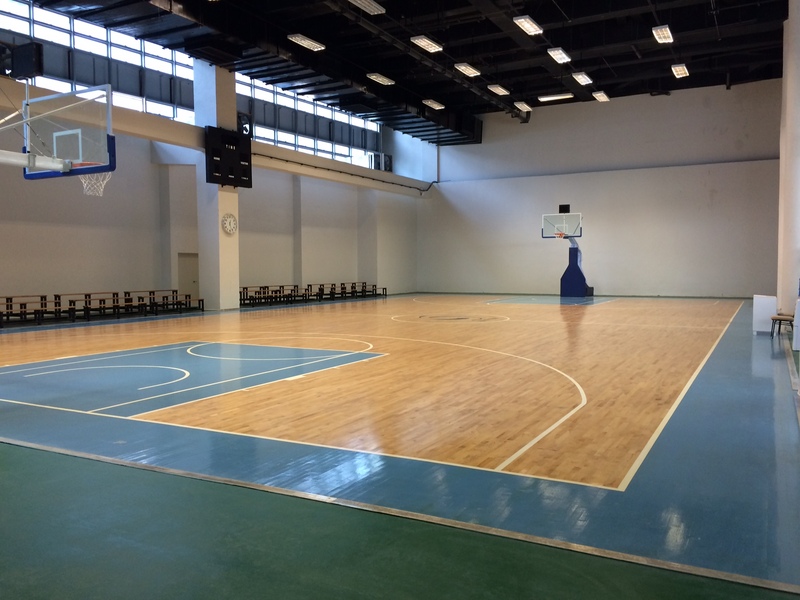 City Club Basketball Court, where Sunday Kendo Sessions will be held. The first Kendo session in City Club will be held this Sunday, Dec 7, from 2pm – 4pm, where the IGA Ken Squad bound for next year’s 15th Hong Kong Kendo Open will showcase their training regimen as a sample class for interested City Club members. This is so that interested members can watch to see what Kendo training is like, especially at the level international competition. IGA Ken Squad to the 14th Hong Kong Open held last March 2014. Last day of classes for the year will be on Dec 21 before taking a break for the Christmas Holidays. Classes will resume on Sunday, Jan 4, 2015, and continue every Wednesday and Sunday thereafter. Payment for non City Club members will be done (for now) on a per session basis, and we are working on a discounted rate if you pay for four sessions and/or eight sessions in advance. This is still being finalized, so those interested in joining the class please contact us for more details. The payment will also cover use of their restroom/shower facilities and allow access to the eating establishments in the club (which are normally reserved for City Club members only). So what are you waiting for? If you are in Makati and free on Wednesdays and/or Sundays, come to City Club and try Kendo there! This entry was posted in IGA-Ken News, Recruitment, Training Schedule and tagged Alphaland City Club, Iga ken, Iga Kendo, IGA Kendo Club, Makati, Philippine Kendo, training, training schedule. Bookmark the permalink. ← IGA Ken Teams Seeded Into Godo Keiko Kai Shiai Finals!